Simple recognition can go a long way in building strong customer loyalty. One of the greatests ways to show your existing customers and new leads that you care is by recognizing them on their birthday. Sending a cheerful birthday email is sure to put the icing on the cake. Nimble provides the ability to connect with your customers in an authentic way and grow your business from those connections. With Nimble you can store your contact’s birthdays, run searches on those birthdays, and set reminders to follow up for this year and the next. We even offer the ability to send a Group Message to all of your contacts. 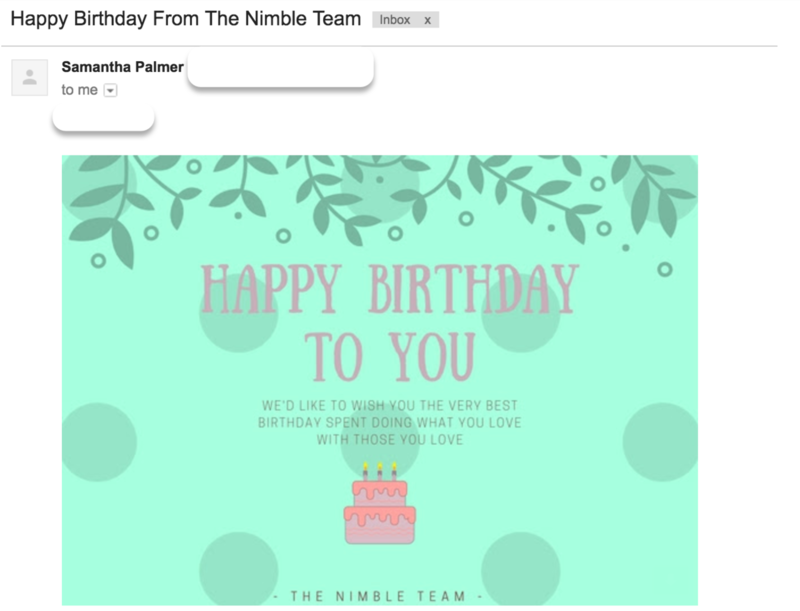 Here’s how you can use Nimble to celebrate your customers on their big day! There are several ways to bring your contact’s birthdays to your Nimble account. You can do this by manually adding the birthday to their contact record, performing a CSV import or connecting your social accounts and letting Nimble automatically sync the birthday from their public social profiles. To find the birthday on your contact record, simply visit the “Contact Info” tab. It will be located under “Personal Information”. 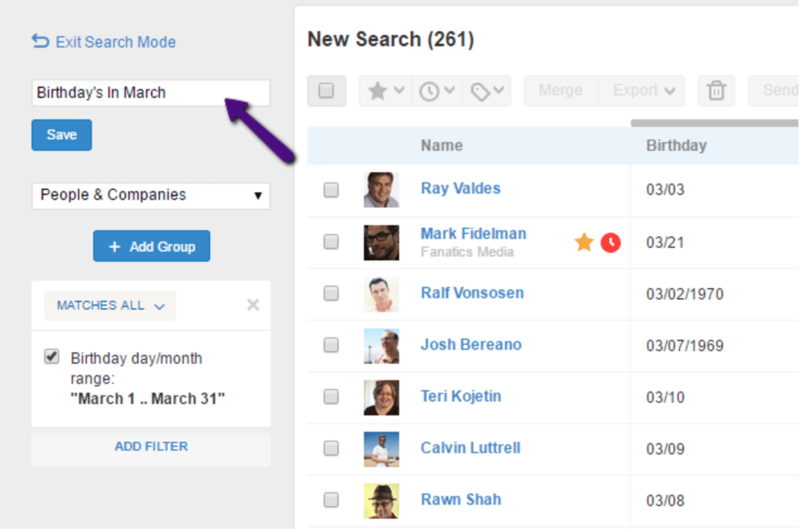 When you are ready to pull a list of birthdays, use our Segmentation feature to achieve this. Visit your Contacts tab and click within the search bar. To the left, click “Add Filter” >> Birthdays. 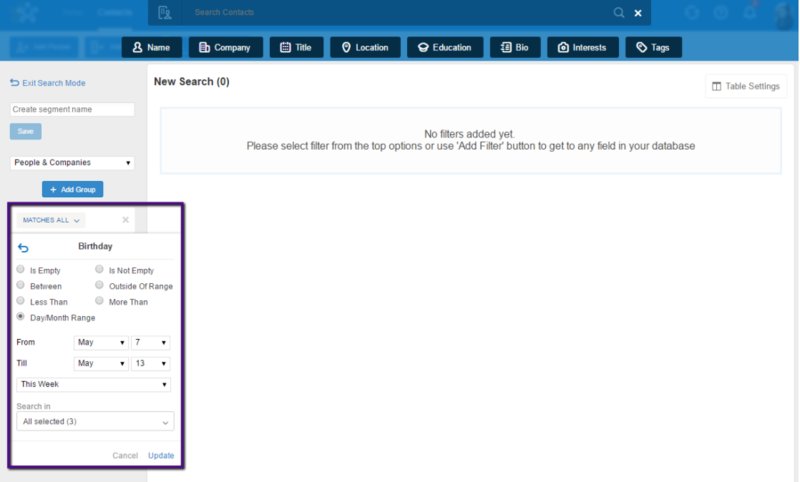 Whether you want to search for every contact in your database that has a birthday entered, find birthdays for the month or a specific time frame, Nimble gives you the option to search for birth dates in a variety of ways. For example, if you wanted to locate every contact in your database that has a birthday in March, you can choose the “Day/Month Range” filter and add a quick filter for “March.” Nimble will now display every contact in your database with a birthday for that month. To easily access this list at a later time, save this segment by giving it a name. Your segment is now saved and will display to the left in the Contacts tab. When the month of March comes knocking, you can revisit your Contacts tab and quickly pull this segment. 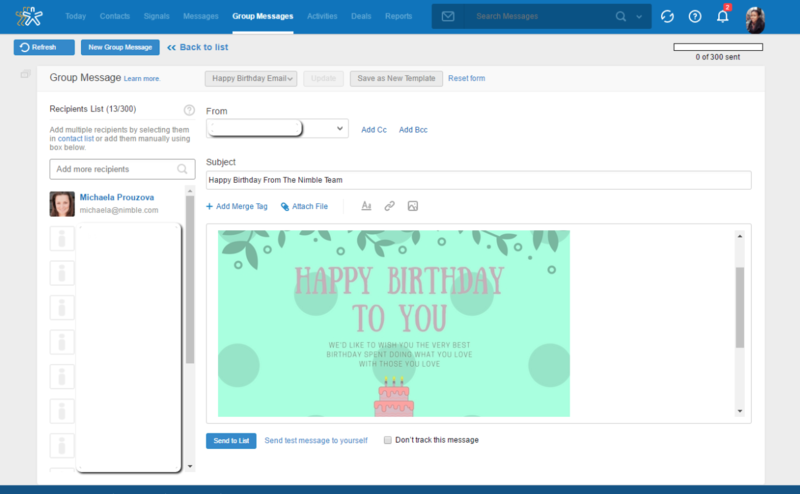 Nimble will send your list of contacts to the group messaging page where you can compose your birthday email by adding images, customizing your fonts, inserting hyperlinks and attachments. Group Messages sent from Nimble are sent over your personal email address SMTP, so it appears as an individual message to your contact and not like an email blast. If you like the email you created, save it as a new template. You can even create multiple templates at once by going to your Settings >> Email Settings. With our busy work schedules, it is easy to build a list of birthdays then forget to follow through on sending an email when the time comes. “Events” are a good way to set up reminders for birthdays and they can be created from the contact record or the Activities tab. In Nimble, we include the option to set recurring events so that you do not need to recreate this birthday reminder every year. 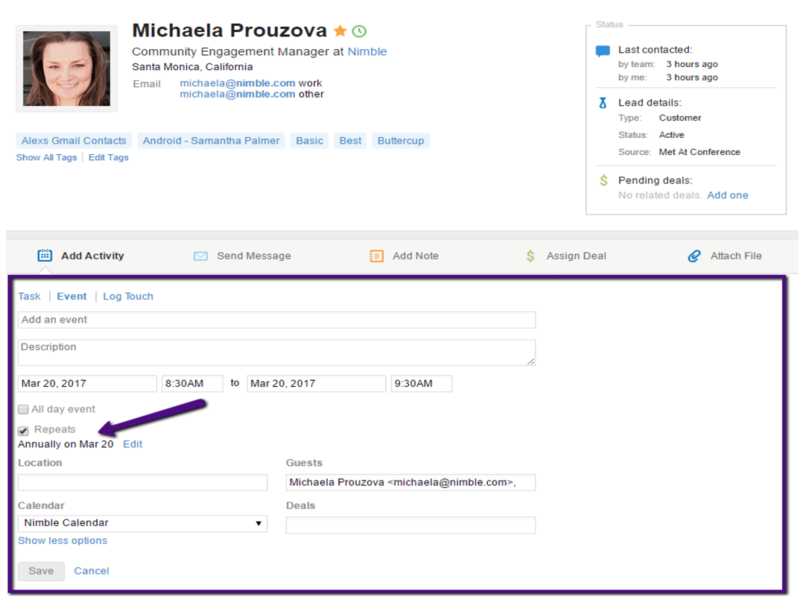 To set a birthday reminder on the contact’s record, simply click “Add Activity” >> Events. 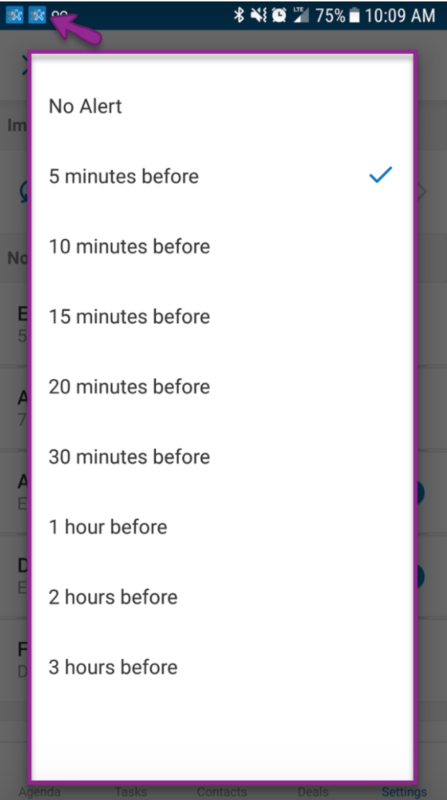 Select “Show More Options” to set a date, time and setup the event as recurring. 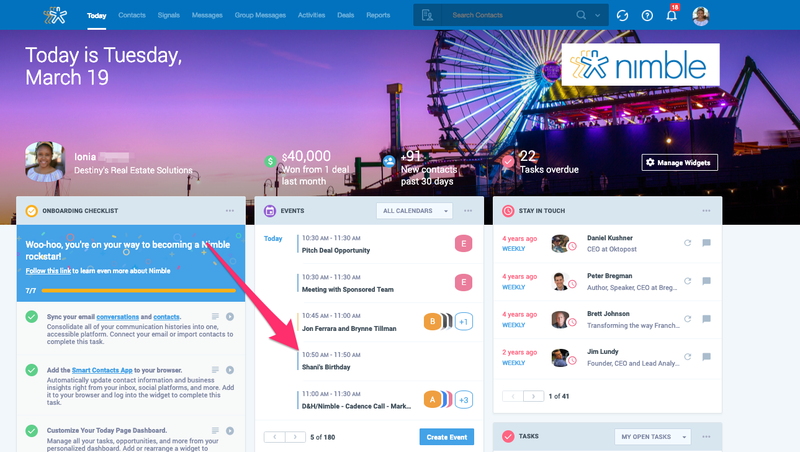 In the Activities tab, you can create a Birthday event by clicking “New Activity” >> Events then adding your contact’s name to the “Guest” field. 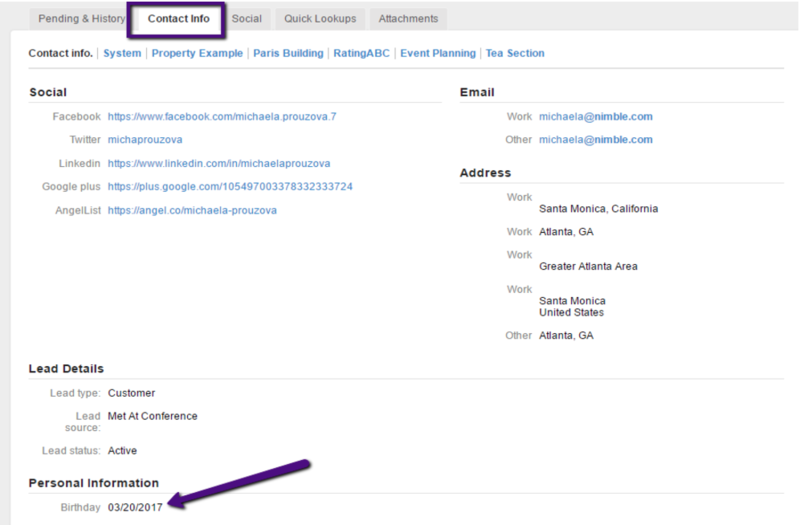 Another great feature offered with events is the ability to send your event to Google Calendar. Nimble offer a two-way sync with Google Cal, enabling you to create events in either app and have it sync bidirectionally. Events for the day will appear on your Today Page - offering you a quick reminder to connect with the birthday contact. Utilize Nimble on your Android or iPhone to view events on the go and set alerts to notify you before the event. Alerts can be setup on your phone by opening the Nimble app and going to Settings. Select “Events” under notifications and choose your alert time. When you take time to recognize your customers on their birthday, it is sure to put a smile on their face as they will be glad to know that someone is thinking of them and wishes them the best on their special day!